For Part I, click here. For Part II, click here. It is important to understand that an Oudolf garden does not begin to show itself until mid- to late summer, when most of the perennials and grasses have matured and flowered so that the garden is full of texture, color and scale. But for me, his gardens really come into their own in the fall, when the grasses have matured into their straw-brown color or reddish and purple tones and other perennials are swaying in the breeze, many of them with seedheads and some still in bloom. One of Piet’s many achievements has been his ability to help re-mold the public’s notion of the lifecycle of a garden, opening up the possibility of the winter garden as a beautiful, magical season. With snow and ice covering the tops and stems of dead perennials and grasses, what were once considered leftovers from the fall garden are now perceived as elements of an emotional and architecturally interesting seasonal garden. In talking about his career, Piet mentioned important colleagues and plantsmen who have left an imprint on him: Rob Leopold, Henk Gerritsen, Cassian Schmidt, Dan Person and Karl Foerster, who he considers to be his idol. For him, Karl Foerster was a great plantsman who intuitively knew how to use grasses in a border: he possessed a vision of how they would feel in conjunction with perennials. Piet is always thinking about his gardens: it is a process that rarely leaves him. Although Piet is in high demand for commissions, I was left with the impression that it is an arduous task for him to meet with potential clients and try to convince them not only about the style of his work but also the time that it will take for his gardens to mature. He feels that most clients still want immediate results with gardens: that they are lacking in patience and are not willing to observe and enjoy the beauty of a garden maturing over time. For Piet, the public may offer positive comments about his work but they are still reticent about fully embracing it. Although one would think that this “superstar” of the gardening world would be basking in all of his successes, I didn’t sense that he is. Instead, I felt a concern and hope that the public would catch on to his work and begin to implement elements of it in their gardens, not because of his ego but because he feels it will be good for the future of gardening. He reminds me a bit of a parent who really does know what’s best for his children and is quietly trying to nudge them towards a certain direction. For Piet, symmetry in design is easy but balance is trickier to attain. When he looks at an architect’s plan, he always asks what the intent of the design is. Over the years, Piet feels that his gardens have come to embody more emotion, complexity, depth, drama and coherence. He discussed how time is one of the critical components in creating a garden: that a gardener needs to watch perennials closely over time to see how they evolve. 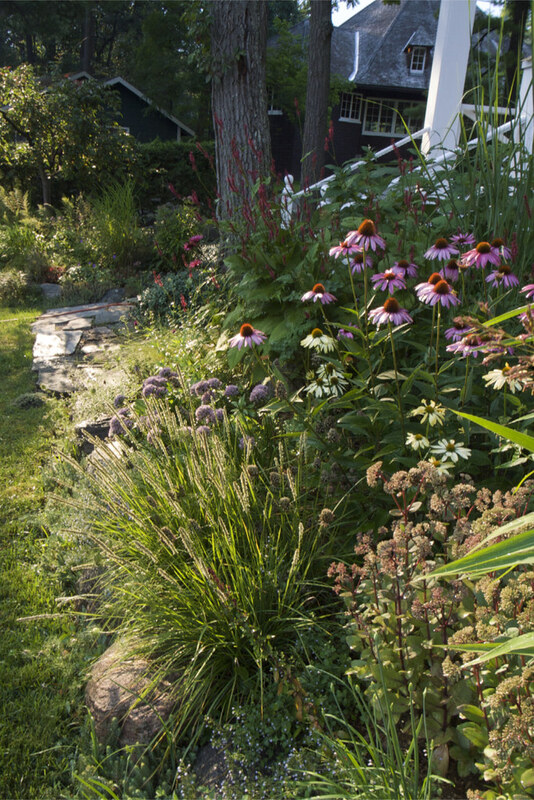 What do they look like in conjunction with companion plantings and how does the “gestalt” of the garden feel once a garden has matured? More than once during our conversation, Piet returned to the concept of complexity in his designs. I sensed when he was using words to try to explain it to me that at the same time, in his mind, he was visualizing certain elements of a garden. Color is not of major importance in Piet’s gardens. He believes that if the right material is used in the right location, then the color will automatically fall into place. He considers brown to be a color, as is evidenced in his late summer, fall and winter gardens. When questioned about reflecting on his work over time, Piet made light of it, preferring to focus on the here and now. Clearly, his work has evolved, and in recent years, in a revolutionary way. He talked about how he has made dramatic changes to his own garden, tearing up and replanting much of the front area. Jacqueline van der Kloet had mentioned that outside of Piet’s office, he designed a border of grasses, with few or no perennials. Where Piet once was known for his flowering perennial gardens with some grasses strategically planted among them, his gardens now feel like a force of nature, with huge sweeps of perennial grasses, from low growing to massive ones as the foundation of the design. I walked away from the conversation with the sense that he is absolutely fearless and relentless in what he does. For Piet, it is the client that counts. After 25 years of work, he feels that clients know that they can count him to get the job done. He said that it takes three years for his job to be finished. Piet needs to watch a garden mature before he feels his work has been completed. For him, the success of a garden is when the design is taken seriously by the client: if that’s not the case, Piet can easily move on and forget the garden. Yet, when clients do appreciate his work, these gardens will always be his babies: he is never able to totally detach himself from them. I can only compare Piet’s ability to the great jazz musician, Miles Davis. His music making was so fluid, effortless and magical that most listeners came to believe that the sounds he made and the music he created, emanated from deep within his soul, with little effort. Similar to Miles Davis, Piet’s work is highly structured. I can best describe the structure of his designs by comparing it to the instruments that comprise an orchestra. Every one adds an important element to the orchestra: with its own unique sound, depth, texture, emotion and complexity. And yet each instrument’s sound is always in unison with all others in the orchestra. The end result is magical, the sum being much greater than the individual parts added together. The process Piet goes through in creating gardens allows him tremendous freedom to explore and let his unconscious rip within the body of the “music.” Without a doubt, thousands of hours have gone into relentlessly studying and getting to know intricate details of each plant and experimenting with different plant combinations and how they intermingle and couple with their neighbors over time. Fran, thanks for the time you have spent documenting the work of Piet and sharing it with all of us! Great photos too. A mini vacation for us how can’t get away! You’re welcome. Interviewing Piet and writing the article was my pleasure. As I told someone else, all pictures were sent to us courtesy of Piet. Incredible writing, Fran. Comparing his garden compositions to jazz music and his perfectionism allows us to see the whole Piet experience in a new light. Thank you. Now I am ready to rip up the whole garden and redo. This won’t happen, but much more thought can and will be put into the organization of the plantings, inspired by your articles. I appreciate your kind words. Am glad that the interview helped to shed new light on Piet and his work. Fran, thank you for these three posts, they have been really interesting. I like the way you have summarised your conversations – this makes it easy to read and very informative. One day I will get to see one of Piet’s borders, I love the pictures but to actually see the flowers and grasses is the next step. Then I will need a bigger garden to make my own interpretation. Thank you, Fran. I really enjoyed this. Thanks for a wonderful interview! Living outside of Chicago gives me the opportunity to visit Lurie Garden, and it is always an amazing experience, especially when you have the chance to see it more than once in the same year and witness the way the plantings evolve. You’ve conveyed most engagingly what Oudolf is all about, digging deep into his design sensibility. This has been a fabulous series. Thank you so much. Fran – Great series, well constructed. Piet’s curiosity, inventiveness, and humility comes through in your writing. He is clearly an artist, and I would so love to throw myself into his grass creations and come out with a picture or two to rival the ones that accompany your piece. Fabulous, intuitive, brilliant, and so wonderful to see the capture of light. Thanks for this great series. Thank you for a thoughtful series. Alas, there isn’t a single Oudolf garden on this continent (possibly hemisphere! ), so it will be a long time before I visit one! Thanks for this great series on Piet and how he approaches his garden designs. I especially like the first picture of the post, with the steel blue standing out among the blackened stems. The descriptions of his work with his clients are very enlightening and show the depth of his human kindness. I did get to Hummelo for a visit in that magical time in early September for Grass Days and it was unspeakably moving and insightful. I also had the chance to meet Piet and your impressions are spot on: a humbler man I’ve seldom encountered and I also sensed a concern for the fate of his gardens—that they are known and understood. BTW: I’m up in Toronto where Piet designed a planting for our botanical garden in 2006. Quite a treasure.